The cost of school supplies can put a strain on families with limited resources, so The Salvation Army is asking local businesses, churches, groups, and individuals to help by hosting a collection. Supplies will be collected now through July 20. The Salvation Army will distribute the supplies on August 3 to families in need. 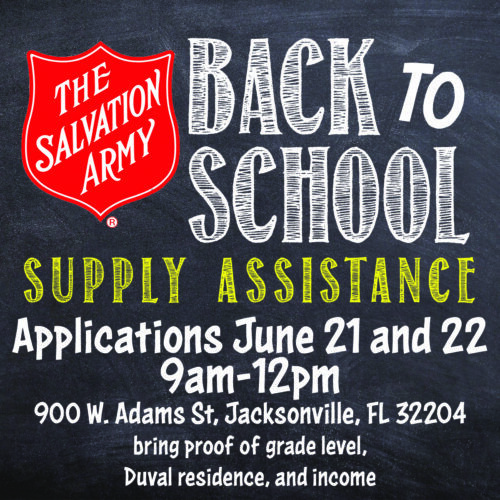 Those interested in hosting a school supplies collection are asked to call 904-301-4846 or email meghan.keith@uss.salvationarmy.org to sign up. Individuals wishing to drop off supplies may do so during business hours through July 20 at The Salvation Army’s downtown locations at 900 W. Adams St or 328 N. Ocean St (Monday through Friday only at the Ocean Street location). For more information, visit www.salvationarmynefl.org.